Forty years ago, audiences might not have known what to make of Two-Lane Blacktop (1971). It is an altogether different type of road movie, an automobile film for the arthouse set. 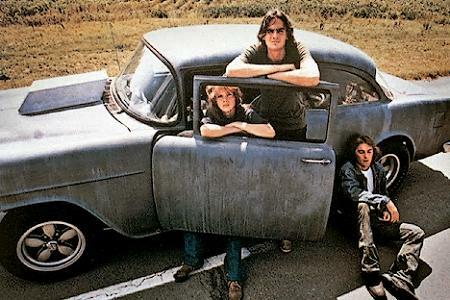 Two-Lane Blacktop has a mesmerising slow burn quality, little action and little story. Automobile buff, The Driver (James Taylor) accompanied by The Mechanic (Dennis Wilson) races against GTO (Warren Oates) across the United Sates as they compete for the ultimate prize: pink slips (legal ownership of the other’s vehicle). For those of you who have seen it once, Monte Hellman’s cult favourite improves the second time you see it. Two-Lane Blacktop is presented in a Brand New 35mm Print, on the big screen—experience it the way it was intended for audiences! Another film ahead of its time was Zabriskie Point (1970) directed by Michelangelo Antonioni. An outsider’s view of America (Antonioni was an Italian native), Zabriskie Point is an effective critique of crass commercialism and unchallenged bourgeois values. Anyone who questions mindless consumerism will probably relate to this film—it has its share of cryptic symbolism, but its social commentary still shines through. Those who don’t question the excesses of capitalism probably need to see this film more desperately than those who already “get it”. It is also an amazing film to see on the big screen: Antonioni really has created some memorable visuals here. Next Post WHO YOU GONNA CALL?